Inventory We are a resale marketplace, not a box office or venue. Ticket prices may exceed face value. This site is not owned by Mountain Winery . The Mountain Winery in Saratoga, California has been offering the finest music, wine, scenery, and food to patrons since 1958, the property for wine making only being open since 1901. 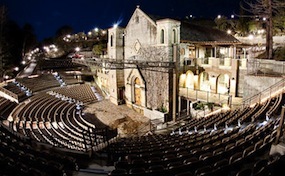 The Mountain Winery provides the most intimate of concert venues with a quaint 2,500 seat amphitheater. Mountain Winery tickets have included such marquee performers as Tony Bennett, Ringo Starr, Ray Charles, Stevie Wonder, The Beach Boys, Carlos Santana, Ella Fitzgerald, and may more. The winery is a California Historical Landmark and is included on the National Register of Historic Places. The Mountain Winery box office generally puts the whole concert series on sale on a Sunday during the spring. Mountain.WinerySaratoga.com is a privately owned and operated website that concentrates on providing the largest online inventory and the lowest prices for all secondary market events. We are in no way affiliated with any primary box office, venue, and or official site. Tickets may be below or above face value and prices change constantly. To order tickets for all Mountain Winery events just follow the online steps or pick up the phone and call our operators at anytime.